This comes from the The Occident and American Jewish Advocate, “the first successful Jewish serial in the United States,” April 1867. It is a partial reproduction of “Sir Moses Montefiore’s Report to the Board of Deputies of British Jews,” apparently from the previous year or maybe even earlier. 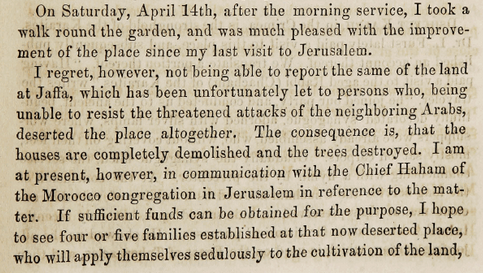 On Saturday, April 14th, after the morning service, I took a walk round the garden, and was much pleased with the improvement of the place since my last visit to Jerusalem. I regret, however, not being able to report the same of the land at Jaffa, which has been unfortunately let to persons who, being unable to resist the threatened attacks of the neighboring Arabs, deserted the place altogether. The consequence is, that the houses are completely demolished and the trees destroyed. I am at present, however, in communication with the Chief Haham of the Morocco congregation in Jerusalem in reference to the matter. If sufficient funds can be obtained for the purpose, I hope to see four or five families established at that now deserted place, who will apply themselves sedulously to the cultivation of the land, which is of considerable value, and ought to be immediately secured by a fence to mark its boundaries.